anyoption provides you with one withdrawal per month that is exempt from commission fees. Beyond that, every additional withdrawal will be charged a fee of 30 USD/25 EUR/20 GBP. Prior to requesting for a withdrawal, a trader will be asked to send his/her identifying papers. anyoption ceased its binary brokerage activities on June 28, 2017. The review below is presented for the archiving purposes. They rightfully claim “anyone can trade”, as they have over 100 assets in their portfolio that allows traders to choose suitable instruments to invest in. anyoption has years of experience in options trading. The company was launched in 2008 with their headquarters in Cyprus. Today, they offer a fully web-based platform for carrying out options trading in a hassle-free manner. It offers a very simple trading system where an investor can trade in simple four steps and can make profits anywhere between 65% and 71%. anyoption also guarantees an out-of-the-money reward of 15%. All needed information is available with simple clicks of the mouse. They support 17 different languages. One can fund their account with a minimum amount of $100 only and the minimum trade size is also of $100, however, no upper limit of trade has been defined. Traders can fund their account in US Dollars, Euros or Pounds Sterling. And they have a host of different funding modes such as credit cards, debit cards, Visa, MasterCard, Diners cards, international wire transfers, domestic payments, Skrill, CashU, U Kash, WebMoney, la Caixa, Santander, giro pay, eps, monetaru, PoLi, teleingreso, sofort ueberweisung.de, and iDEAL. anyoption offers a wide range of binary options to a number of traders from different parts of the world. They offer a large collection of 108 assets and this is the reason why the majority of the traders can find a suitable trading option with anyoption. Availability of a wide range of assets brings in more traders to the company. anyoption is a regulated company and their 15% out-of-money refund is one of the highest refunds offered by any binary options brokers in the industry. This is the reason why it appeals the beginner traders. Moreover, they do not offer any bonuses, as they believe in helping investors to make real money in the market and they do not lure traders like some other brokers do by offering huge bonuses. This also underlines the reliability and legitimacy of anyoption as an options broker believing in actual trades. They provide market breaking news that helps a trader to be aware of real-time market developments. Traders can also opt for receiving free SMS related to the market updates. The anyoption platform offers technical analysis tools such as Profit line, Take Profit, Roll Forward and Show Off that help traders to anticipate the market movements. They also provide live quotes from Reuters. They also have mobile apps for iPhone and Android Phone users. The apps can be downloaded from their website for free. The mobile apps allow traders to access and manage their accounts using their mobile devices and a trader can perform real-time trading from anywhere. anyoption has a unique trading platform with a very simple user interface. 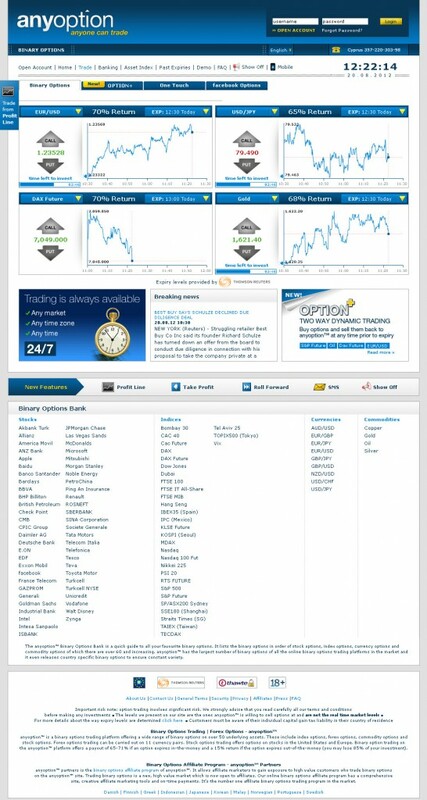 The interface is highly intuitive that guides the traders to trade Forex, commodities and stocks in a simple manner. The platform is flexible and one can choose any investment and the expiry date of their choices to execute trades. Even beginner traders can start trading with confidence with the 15% out of the money reward guaranteed to them. They do not provide a demo account, however, they have an interactive demo presentation that explains the working of the platform and guides investors to trade using the anyoption platform. 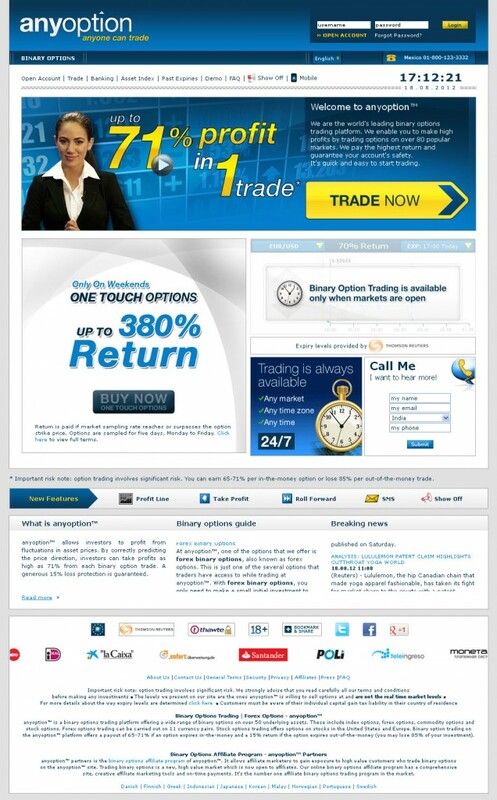 They also offer a Binary Options Guide that explains everything about Binary Options trading. They also have a FAQ section that helps to understand several important things about binary options and the anyoption platform. They offer 24-hrs Phone support available 5 days a week from Monday to Friday. anyoption is a very good trading platform for the beginners considering the fact that they have their minimum deposit of $100 only and they offer 15% out-of–money refund as well. Moreover, they offer a large number of options, which can bring forth suitable trading options for the majority of the traders from the various parts of the world. Their mobile apps also offer flexibility and a trader needs not to remain glued to the PC for executing trades. Free SMS update and real-time news highlights are also additional advantages. However, they do not offer any bonuses like most other brokers and some investors may find it less appealing. They do not charge any commission for one withdrawal per month. However, each additional withdrawal per month will involve a commission of 30 USD/25 EUR/20 GBP. Besides, prior to requesting for a withdrawal, a trader will be asked to send his/her identifying papers as well. This could be another feature that many traders won’t find suitable for them.